For complete security, it is often necessary to restrict or control vehicle access around commercial and industrial properties. Here at Abacus Shutters, we offer an excellent range of telescopic bollards in London and Essex which give you the control and the security you need. Telescopic posts in London give you an effective, attractive and flexible way to control vehicle access whenever you need to, whilst still allowing pedestrians to pass through at all times. The Rhino Security range of telescopic posts in London and Essex from Abacus Shutters provides a simple, secure and cost effective method of protecting premises and vehicles. Strategically located in forecourts, car parks or shop fronts a Rhino post® is a true deterrent, yet it is also aesthetically pleasing. The Rhino post® is simply raised vertically out of the ground and locked in seconds into the upright position using its integral high security push button lock. When not in use the post slides discreetly into its host tube until just below ground level and the steel flap is closed flush.The Rhino range of telescopic bollards in London is manufactured in steel, stainless steel and Rhinocast® polymer and is available in a wide range of colours and finishes. The main components are precision manufactured by computer-guided lasers for greater accuracy. Each of these telescopic posts in London and Essex is assembled by hand and inspected at all stages of manufacture to ensure consistent quality. The 10 pin high security push button lock allows for over 5 million key combinations with master key facilities also available. All steel bollards are hot dipped galvanized to BSEN ISO 1461 (1999) and can be powder coated to most British Standard or RAL colours. Stainless steel bollards are manufactured from 316L grade austenitic steel. 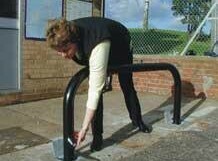 Rhino steel hoop barriers are supplied either fixed or detachable. A detachable steel barrier may be part lifted to act as a gate allowing quick vehicle access, or can be completely removed. 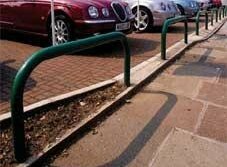 It is an ideal way of securing large perimeters, allowing pedestrian access whilst denying vehicle entry. Rhino steel hoop barriers are supplied in either 60.3, 76.1 or 88.9mm diameter sections with an overall span of 1400mm and are supplied fully galvanized to BSEN ISO 1461 (1999). They can be powder coated to most British Standard or RAL colours. For further information about steel hoop barriers and telescopic bollards in London and Essex please call us on 0845 644 1225.